PDO Threads & Thread Lifting is a revolutionary treatment! When inserted into the skin, the threads act as a “scaffold” for the skin that helps to hold the skin against the effects of gravity. These “mesh” of threads can also shape the face by supporting and tightening sagging structures, and are perfect for all areas of the face, in particular areas such as the jowls, double chin, jawline, neck, and specific wrinkles like crowfeet and forehead lines. The threads are extremely versatile and can be used all around the face and neck. 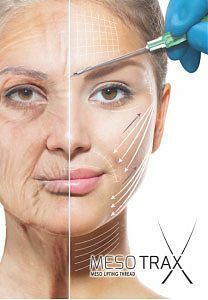 They can treat drooping cheeks, pronounced nasolabial (nose to mouth) and marionette (corner of mouth to chin) folds, sagging jawline and neck and folds and wrinkles on the chin. The treated area is anaesthetised with cream minimising any pain or swelling, and the sensation can be described as a slight stinging, similar to an acupuncture treatment. The procedure takes approximately 40 minutes to one hour (depending on the number of threads used. On average, approximately 40-50+ threads are needed for the whole face). The first effects are visible after 3-6 weeks, but considerable improvement appears after 3 months, when induction of new collagen begins. The effect however is long lasting (up to 2 years). Bruising can happen. The degree of bruising varies not only depending on the area being treated, but also from patient to patient. However, you do need to be aware that considerable bruising could possibly occur after the cog thread lift, and plan your social calendar or work commitments around this.